USED SUPER STUD HAS JUST BECOME AVAILABLE. 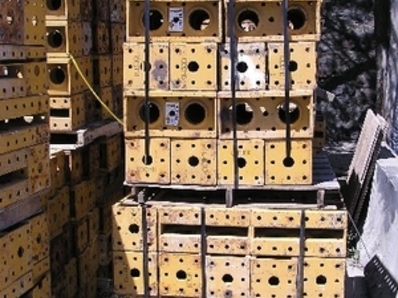 A Large inventory of EFCO Super Stud is now available in very good condition. See quantity and description below. 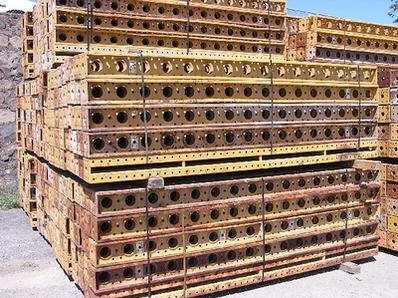 The modular EFCO Super Stud System allows functional & adaptable all steel beam arrangements of the EFCO Super Studs for many, many different applications. The bolted connection develops the full strength of functional & adaptable EFCO Super Stud all steel beam. The functional & adaptable carrying end connection of the EFCO Super Stud can be extended to almost any length. EFCO quick bolts run down both functional & adaptable all steel beam flanges of both efco Super Stud channels on 3" centers. The transverse efco Super Stud channel flange holes are at 6" centers of the all steel beam. 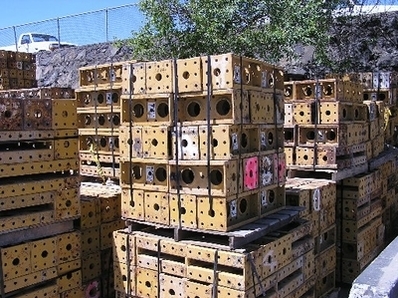 There are 13/16" holes in the web of the efco Super Stud channel all steel beams. The bolted all steel beam connection develops the full strength of the EFCO Super Stud. Super Stud Jr. is dimensioned proportionately when Super Studs are bolted end-to-end as a continuous functional & adaptable all steel beam. Super Studs are available in both the 9" x 9" all steel beam system and 6" x 6" Super Stud Jr. System. The functional & adaptable of the Super Stud comes from its design and rigid continuous all steel beam. The backbone of the Super Stud System is the lightweight, high strength EFCO Super Stud all steel beam. Super Studs are available in four modular all steel beam sizes which, when combined with SUPER STUD accessories, offer the functional & adaptable of a giant erector set. The Functional & adaptable vertical EFCO Super Stud flange and web holes are available for lateral all steel beam bracing connection on tall and slender shores. Precision EFCO Super Stud end plates are exactly perpendicular to the stud and precision jig built making it possible to bolt studs end-to-end for use as continuous all steel beams. Two rows on 6" centers provide for a multitude of all steel beam uses and are a key to the flexibility of the EFCO Super Stud System. The basic 9" x 9" EFCO Super Stud is fabricated of two Functional & adaptable light weight formed all steel beam channels 2-1/4" apart welded together with two 1/2" thick end plates and spacers 3' on centers. 9" on centers in the channel webs make the Super Stud even lighter and open up the space between the channels for ease in making bolt up all steel beam connections. The EFCO Super Stud is a complete system of lightweight all steel beams and accessories that give you total all steel beams functional & adaptable. The two spaced efco Super Stud channels form a Functional & adaptable all steel beam for symmetrical loading and rotational stability. The 2-114 inch spacing of the efco Super Stud all steel beam channels allows large she bolts. Efco Super Stud lightweight all steel beam strength ratio and its two axis module. Key to flexibility & lightweight EFCO Super Stud Channels are functional & adaptable 6x6 all steel beams. 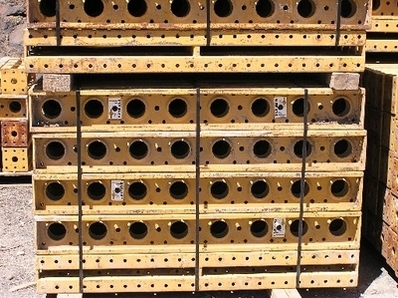 EFCO Super Stud all steel beams are compatible with other EFCO Formwork Systems.